I love, love, love potato chips. But I very rarely buy them, because I will massacre the entire bag. I have absolutely no self control when it comes to potato chips. Especially when there’s dip around! But sometimes temptation gets the best of me and I buy the chips and (course) make some chip dip. Have you noticed how chip dips always make a massive batch? 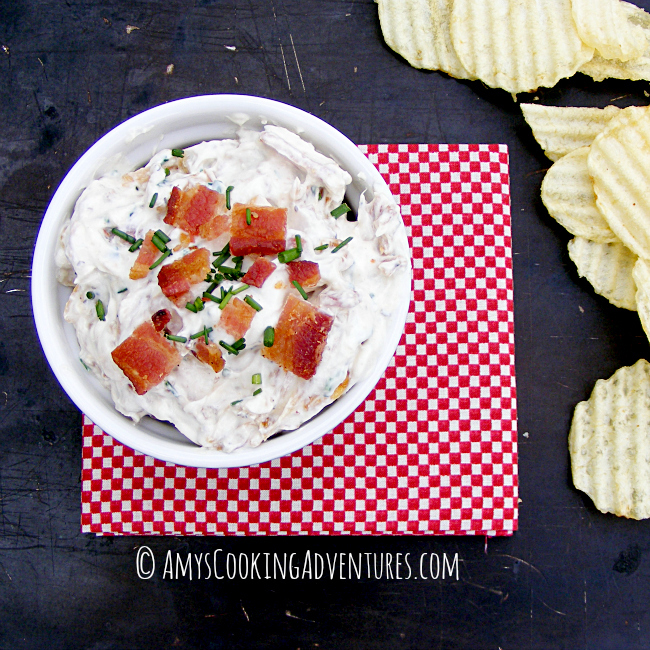 Sometimes I don’t want a ton of dip around (I can only work off so many chips during Zumba), so this time, I whipped up a quick dip recipe for two! It starts off with a single serving container of Greek yogurt (you see what I did there, that means this dip is even kinda healthy-ish). Then I tossed in some bacon & caramelized onions and a few more bits of deliciousness. I dare you to not eat the whole bowl. Could you eat this with veggies? 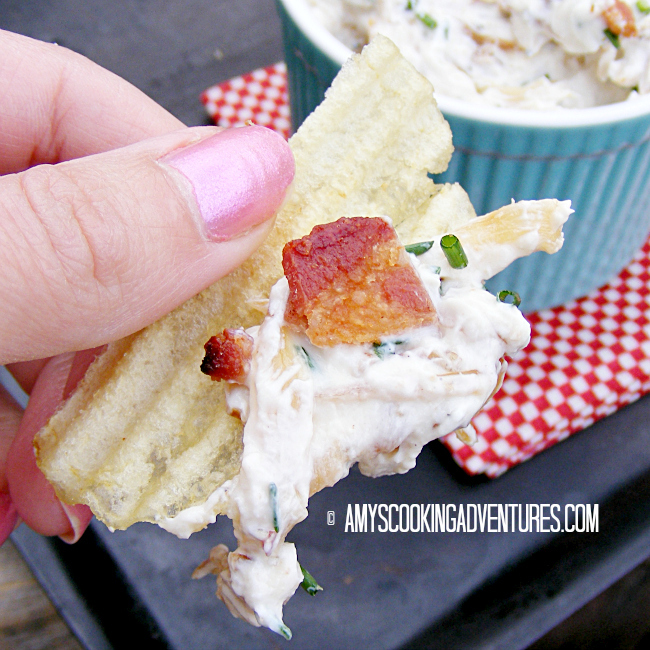 Sure, but take it from me – this dip is made for nice, salty potato chips! To caramelize the onions, heat the olive oil in a medium skillet over medium-low heat. Add the onions and stir to coat. Cook for 2-3 minutes or until the onions begin to soften. Reduce heat to low and cook, stirring frequently, until the onions have reached a deep amber color. Depending on the thinness of the onions and heat of the stove, this will take from 35-60 minutes. Once the onions are almost cooked, add the garlic, salt, and pepper, and cook for another 5 minutes. Place the onions in a bowl and set aside to cool. To make the dip, combine 1/3 cup of the cooled caramelized onions, along with the remaining dip ingredients and stir until well combined. Cover and place in the refrigerator for at least 30 minutes or overnight. Serve with potato chips. Use any leftover onions on Burgers, Steaks, or Bread! 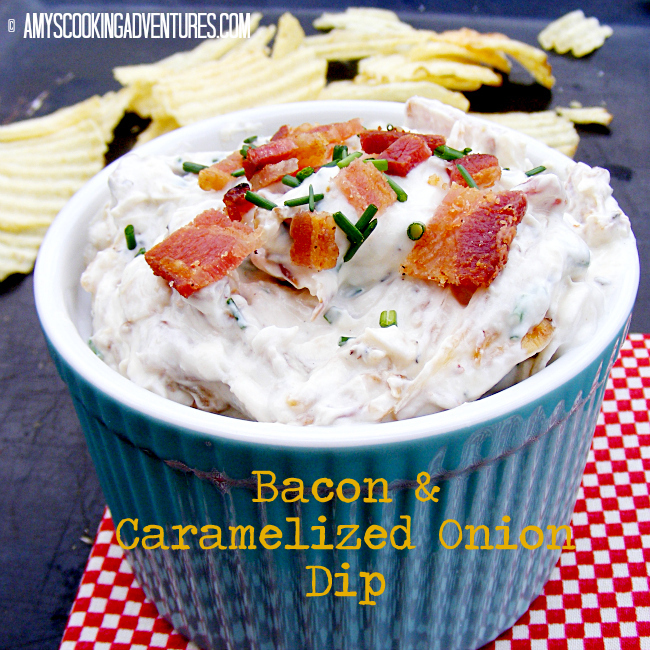 ohmaaaaahgaawwwd now I just want this dip soooooo badly!